Today I had a bit of luck again and I found an eagle. I started my hike at the Schellbruch Area, and then I saw the White-tailed eagle far above me that you can see in the photo of this post. I do already have a lot of experience to spot them in the heaven as I saw them many times. The big problem is that they often fly at a high altitude, but they fly or glide very slow. So, it’s easy to find out if it’s the White-tailed eagle, but it’s pretty difficult to take the photo because of the high altitude, and that means I have to point my camera straight up and I really don’t like that perspective. Anyway, I am always happy if I can get a photo of one at all. I never had the luck to see them hunting at low altitude, but I hope I will see this one day when I have my camera with me. By the way, I took another photo of a White-tailed eagle some time ago, but that happened somewhere else, and it was an adult eagle, they look a bit different then. Here is the Wikipedia link. Beautiful site. what a privilege. 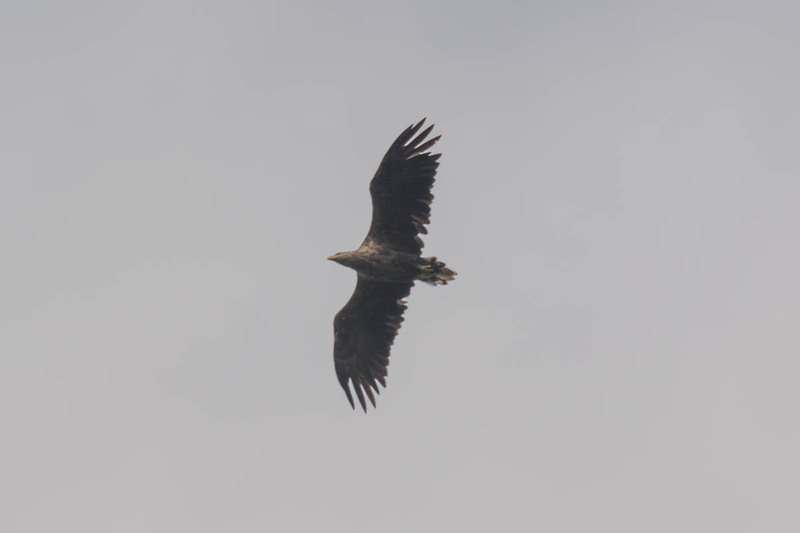 Hve seen Golden Eagles above Loch Callater and east of Dalwhinnie but never a white tailed. Magnificent. They were almost extinct in Germany, but now they are back and it’s easier to find them with each year. In the last two years I saw them pretty often, although I still read in the newspapers regularly that some evil humans kill them with poison, it’s sad. I’m impressed. That’s a very hard shot to get. From ANY angle. I’m also glad that your eagles have come back. Our American eagles were almost extinct, but they are back and doing surprisingly well. And yes, some morons with more bullets than brains still hunt them. Thank you. And same here about the extinction, they were also almost extinct in Germany too… Just over the last two years I am starting to see them more often, especially in the nature reserves around our city. It seems that the population is increasing very well here. But as in your country, we have a lot of idiots who do kill the eagles, mainly with poison here, and I have read this several times now in our local newspaper 😦 Then there was also another case without poison in our city where people found a nest and they killed them… I don’t get why people do that, it’s horrible. In the case of poisoning, it’s assumed that fisheries at ponds are interested to kill local eagles. And there have been cases where some eagles were found shot here too, and morons is the right word. Anyway, I am glad that local conservationists do a great job to help the population increase again, they do for example monitor the population and the areas where they found nests, they built fences and declare areas where people aren’t allowed to hike, so that nests are not disturbed and so on. I’ve never seen a white-tailed eagle before. You did a great job capturing it. When I try to gets shots like that, the birds always manage to get themselves out of the frame before I can press the button.